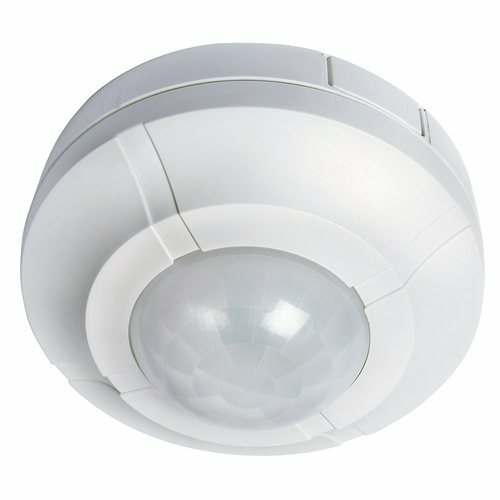 360° ceiling surface mount PIR presence detector. 6m diameter (3m radius) detection range at 2.5m mounting height. No creep zone - maximum coverage. Light ON time adjustable from 5 seconds to 18 minutes. IP44 weatherproof rating (rated for restricted internal applications). Adjustable light level control. Total PIR switching: 2400W (e.g. 20x 100W GLS) incandescent or halogen, 500W fluorescent, 150W CFL/Low Energy, LED lamps <10W Lamps, max 10, LED lamps >10W <32W, max 5 sets. Not suitable for discharge lighting. Total PIR Switching: 2400W Incandescent/Halogen, 500W Fluorescent, 150W CFL/Low Energy, LED lamps <10W Lamps, max 10, LED lamps >10W <32W, max 5 sets.